When we decided to eliminate white flour from our diet years ago, a good French baguette was the one thing I missed most. Bread with soup, bruschetta, crostinis with baked brie, homemade croutons, and garlic bread were all off the menu until I could find or make a better alternative. Converting from white to whole wheat was not enough; there was the issue of the phytic acid in untreated grains that I also wanted to avoid. This Sprouted Wheat French Bread was just the healthier choice I was looking to find. Phytic acid in grain combines with key minerals, especially calcium, magnesium, copper, iron, and zinc preventing their absorption. Soaking or sprouting the grain before baking neutralizes this acid, releasing the full benefit of the grain. This simple step also aids digestion, avoiding that too-full feeling often experienced after eating bread products. Although it was easy enough to find sprouted sandwich bread at the health food store, a sprouted wheat baguette was nonexistent. At first, I was intimidated by the idea of soaking flour (8-10 hours) or sprouting grain to make a loaf of bread. It was easier to just avoid bread at dinnertime all together, but as I said, I missed it. 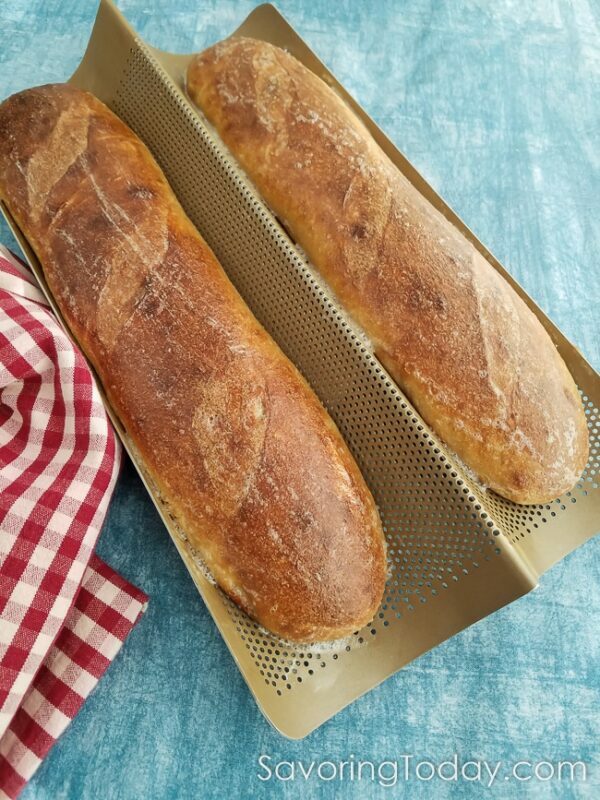 With a little research and determination, I converted a French bread recipe to include the soaking method with great success, yielding a wonderful loaf with the classic pull and chew I always loved about French bread. So, when I conveniently found sprouted whole wheat flour at Whole Foods and on-line, ready for recipes without soaking, I was pretty excited. My bread basket can now be filled any day of the week. This recipe requires a little time to let the dough rest, but the work is minimal and the loaves are beautiful and delicious. I often bake and freeze several at a time, so it is easy to enjoy healthy, whole grain bread any time the mood strikes. 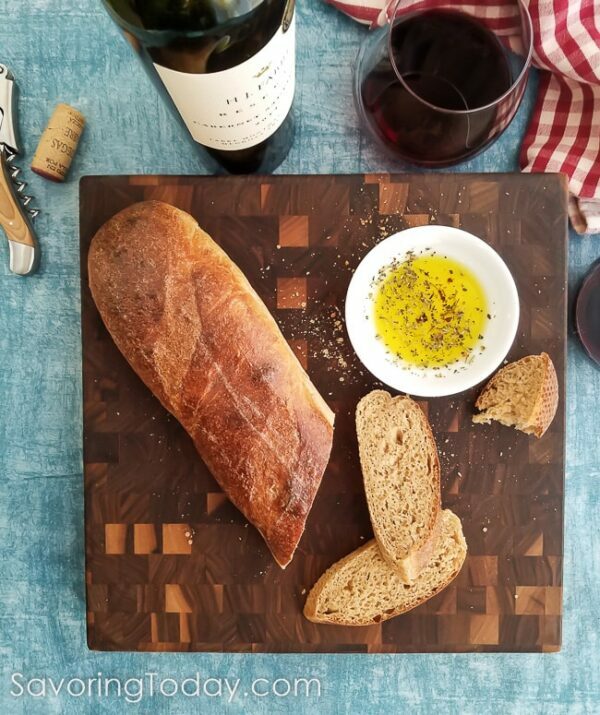 Fresh baked French bread warms the house and draws everyone to the kitchen with hope for tasting—just be sure there is extra-virgin olive oil nearby for dipping. Sprouted White Whole Wheat Flour. You absolutely can make this recipe with any sprouted whole wheat flour. However, I highly recommend the white wheat variety, which is what I used.White and red wheat have the same levels of nutrition, but white has a sweeter, mild flavor (less wheat-y) and produces a lighter texture in softer baked goods like rolls and pastries. Patience. The trick is to be patient during the folding process and allow the flour to absorb the liquid in the recipe—and you may need to let it rise a little longer. A French bread with pull and pleasantly chewy soft interior. Its mild wheat flavor yields to the bright green tang of extra-virgin olive oil used for dipping. In a large bowl or stand mixer, combine water, yeast, and honey. Allow to stand 5 minutes for yeast to soften and begin to bubble. Mix in the salt and half the flour (about 2 1/2 cups) until smooth. Cover and set aside at room temperature for 3 hours. Mix in the remaining flour 1/4 cup at at time, up to a total of 4 1/2 cups, mixing thoroughly, until dough begins to hold its shape. The dough should be sticky but not runny. 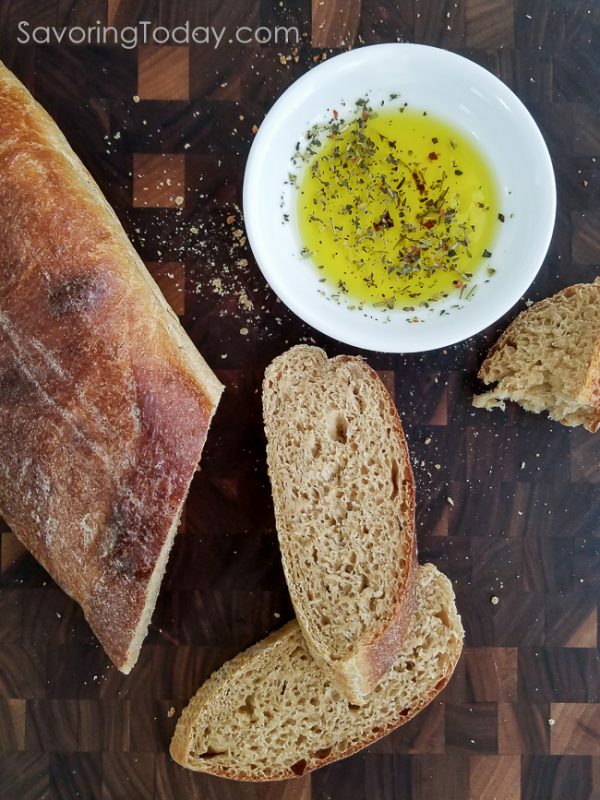 Don't be tempted to continue adding flour or the bread will be dense -- using a mixer to knead helps prevent adding too much flour to the sticky dough.
. With a little oil on your hands or using a pastry knife, lift and fold the dough onto itself 4 or 5 times. Repeat the 5 minute rest, followed by folding, three more times. (This process will take about 20 minutes.) During this folding and resting process, the dough should continue to stabilize and form a soft ball, though it will still be somewhat sticky. Lightly oil a bowl with olive oil. Place dough in bowl, then turn over so oiled surface faces up. Cover with plastic wrap and a dish towel and let rise for 1-1 1/2 hours, or until double in size. Turn dough onto a lightly floured surface and gently knead again. Divide dough into two parts. Roll each half between your hands and the counter (you may need to flour or oil the counter) to stretch the dough into a long loaf shape, about 15" in length. Place on a baking sheet or in a baguette pan (see photo). 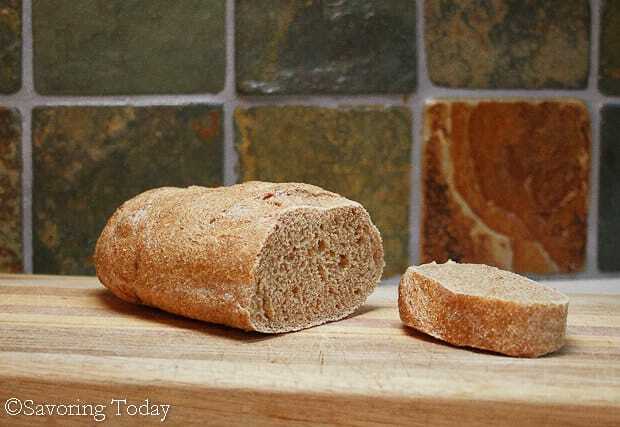 Slice the tops of the loaves diagonally about 1/4" deep with a razor blade or sharp knife. Let rise for about an hour, until doubled in size. Heat oven to 450°. Place a shallow pan of hot water (about 1 1/2 cups) on the lowest bottom rack in the preheated oven. 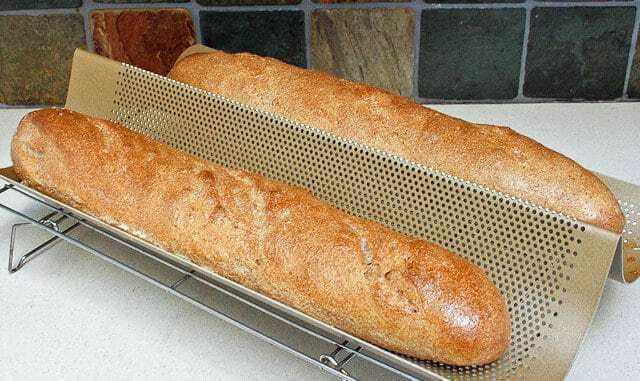 Bake baguettes on the middle rack for 12-14 minutes, watch to be sure the loaves do not become too browned--tent with foil if browning too fast. While the loaves are baking, prepare the egg wash by gently mixing 1 egg white and 1 tablespoon of cold water. Remove the pan of water and brush the loaves with the egg wash. Return loaves to the oven and bake for 3-5 more minutes or until loaves are golden brown. Cool completely before slicing. Serve with butter or olive oil or dipping. Baking the bread with a pan of water to replicate the steam ovens used in French baking creates a crust that has pull and is pleasantly chewy. However, in areas of high humidity, it is not necessary and can make the bread seem under-baked when finished. Simply bake the bread as directed without that step. This post contains affiliate links. 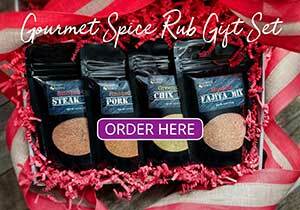 Thank you for supporting what I do here at Savoring Today. For more information, please see our Disclosure Policy. I timed the bread at almost 6 hours not 4 hours total. Even adding up the minutes in your directions comes to almost 6 hours. My wife was dissapointed the bread was not ready when I told her it would be. Hi FarmerDave! Thank you for taking the time to comment and offer feedback — it goes a long way to making Savoring Today better! I am sorry to hear your wife was so disappointed in the timing of the bread, I would be too. I have adjusted the recipe to reflect the appropriate time (this summer I updated the recipe and missed adjusting it then). I do hope you’ll let me know how you liked the bread itself. Thanks again. Sorry 2nd question. What does the three hour soak do for the bread? Hello again, Sue. 🙂 The 3-hour rest allows the flour to absorb the moisture and should result in the need for less flour which will result in and a lighter loaf. This is especially helpful with whole grain flour and a recipe that doesn’t benefit from the addition of eggs or milk to help produce a tender crumb. The recipe is delicious. My bread stuck to the french bread pan even though I oiled it. Do you have any problem with the loaves sticking? Hi Sue, I’m so glad you like the bread, I think it’s delicious too! No, I haven’t had an issue with the loaf sticking, but sometimes the egg wash can seal the edge so I loosen it with a spatula and it pops right off. Also, it is hard to tell by the photo, but there is a thin non-stick coating on this pan. I have found with other recipes like Banana Bread that if I line the pan with a piece of parchment paper, even a small one, it still browns nicely but there’s no issue with sticking. I’ll bet that would work here too. Also, some pans become seasoned over time, but that will depend on the pan you have. Oops! Nevermind, I found it! This bread looks amazing! Could you give the soaked flour version of your recipe instead of the sprouted version? I love the good ol’ stick bread! (baguette literally translates to “stick”) Yours look like it has a very fine texture! Love the crispy crust! I wish I could get a peek of the inside! 😀 Awesome job!! Your bread pictures are sooo relaxing to me. When I read your posts I just feel calm. I like making bread myself, but for some reason I just don’t seem to very often and when I do, I tend to make quick breads like chocolate chip pumpkin bread… not at all the same process! I know what you mean, but quick breads have a place too! I don’t think fall would be quite the same without pumpkin bread on the counter to welcome it. I’m unfamiliar with sprouted wheat, so I’ll have to pass this recipe along to Liz who is the baker in the family. Perfect looking bread in my opinion! I am a spontaneous cook…even when I supposedly have a plan. 🙂 Thanks for sharing the tip about buying sprouted wheat flour. Your French bread looks fantastic. Thank you for sharing this recipe with the Hearth and Soul Hop. Thank you, thank you, thank you! We too are trying to eliminate white flour and I miss crusty bagettes almost as much as I miss my kids and grandkids who all live in another state! 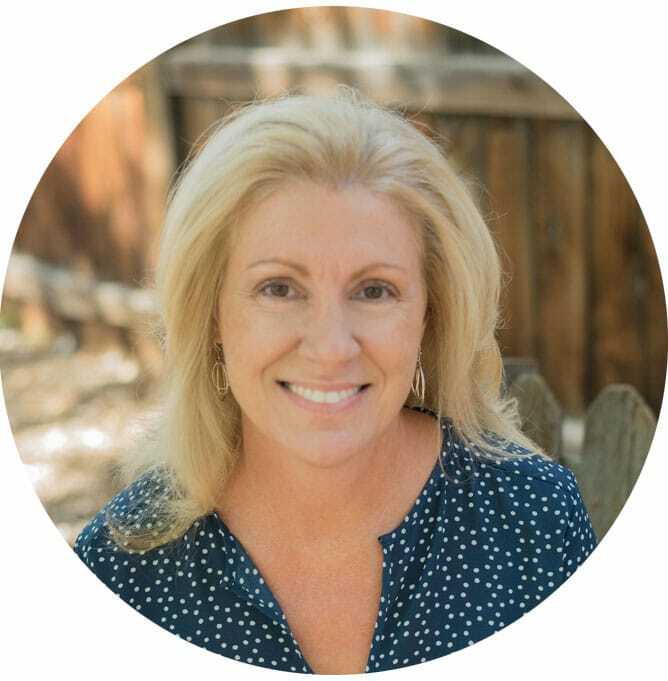 Your pictures are gorgeous and your blog is so informative. I will be back. P.S. Any healthy pasta recipes? Hi JIll, pasta is another tough one, as I love everything Italian. However, to reduce our consumption of wheat (our daughter is sensitive to gluten), we use Ancient Harvest Quinoa Pasta. It is the closest to regular pasta we have found and we all really like it. It is a corn and quinoa mix and if you didn’t know you were eating gluten-free pasta, you wouldn’t know it (if that makes any sense). Is that what you meant, or were you asking about healthy sauces? I’m so excited to try this! I too have given up the bagette but miss it soo much! I will occassionally splurge, but now I may have my bagette back in my life…in a much healthier version!! You make this sound so easy! I have yet to have good luck with French bread. Will give this recipe a shot.